Mr William Coxe was for several years a member of Congress from New Jersey but such was his fondness for pomology that notwithstanding the many demands upon his time in consequence of his political and other pursuits he still found leisure to collect materials for an enlarged and elegant edition of his work on Fruit Trees. This unfortunately, he did not live to bring to perfection. It had been his intention that the second edition should have contained beautiful colored engravings to accompany the descriptions of each of the fruits mentioned in his book. For this purpose his daughter, Mrs McMurtrie still living in Philadelphia, and her accomplished sisters had prepared numerous accurate drawings of life size upon Bristol board of the fruits to be represented and then painted them in water colors with wonderful fidelity to nature and with such delicacy of touch and such genuine artistic sense of color that it is greatly to be regretted that these evidences of early American art have not seen the light in the form originally intended. William Coxe wrote the first book on American pomology, A View of the Cultivation of Fruit Trees, and the Management of Orchards and Cider published in 1817. This seminal work can be read online via google books and archive.org. The watercolor pomological illustrations presented here are from an unpublished atlas of apples that is in manuscripts collection of USDA National Agricultural Library. William Coxe also had a “national reputation for his cider, at an age when it was a famous and characteristic beverage” this according to Proceedings of the State Horticultural Society at Its Annual Session, Volume 42 , New Jersey State Horticultural Society, 1917. For all additional information on William Coxe published on this blog, look here. Image Credit: Special Collections, National Agricultural Library. Collection: William Coxe Manuscript. Contains Manuscript and Atlas. 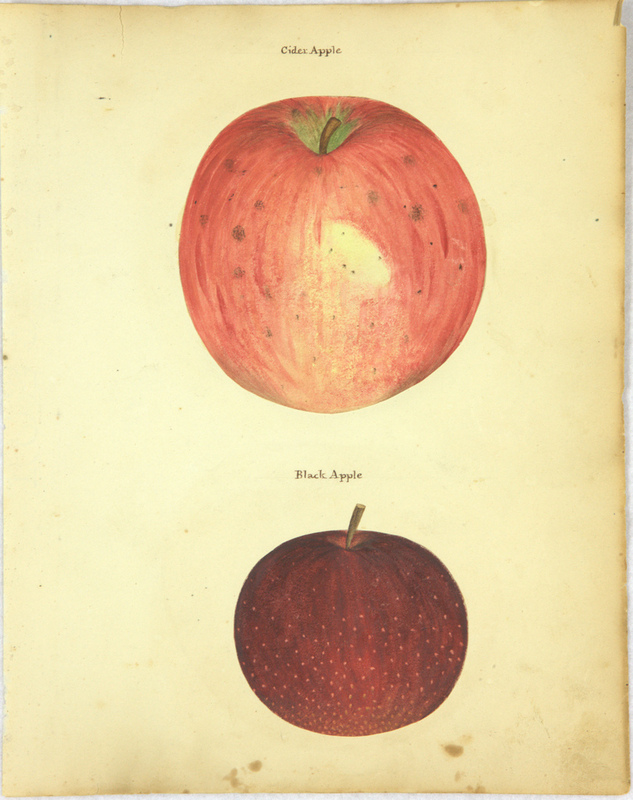 The Unpublished Atlas: A List of Apples. A View of the Cultivation of Fruit Trees by William Coxe. Images of the 24 pomological watercolor illustrations, on 12 plates, listed below, are posted on at USDA National Agricultural Library website in the Rare Books Special Collections Image Gallery. The complete Atlas is digitized, but not all images from the Atlas are currently available in Rare Books Special Collections Image Gallery. The originals are full size watercolor illustrations on Bristol board, created by Elizabeth Coxe McMurtry and her sisters to illustrate the unpublished second edition of their father’s book. 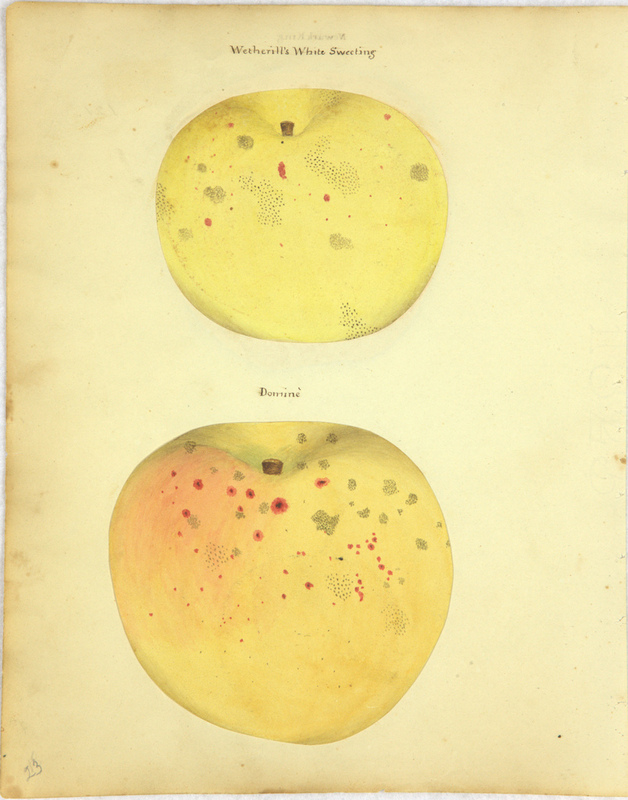 It is possible these images were painted circa 1817-1831, making them some of the earliest known color pomological illustrations of American fruits. An 1857 article in Country Gentleman magazine describes the watercolor illustrations in detail, indicating they were executed prior to that date. Note: The Atlas contains many more illustrations. The images posted are only a selection. Collection Description: The William Coxe Manuscript is a two-volume, undated manuscript on pomology. 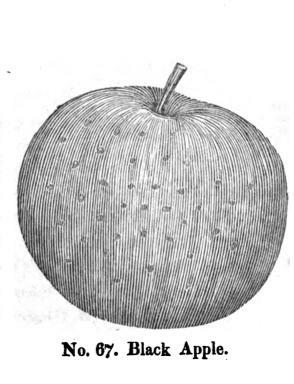 The first manuscript volume contains 832 pages of text and sketches of fruits which William Coxe used to write A View of the Cultivation of Fruit Trees in America, published in 1817. This volume includes notes with dates ranging from 1810-1828. The notes were intended for use in a second edition of A View of the Cultivation of Fruit Trees in America, which was never published due to Coxe’s death. The second manuscript volume consists of an atlas of life-size, watercolor plates of fruit on Bristol-board, painted by Coxe’s daughters. The watercolor plates are cut out from the Bristol-board and fastened to the leaves of the book, then each name is handwritten in pen above the illustration. Historical or Biographical Sketch: William Coxe (1762-1831), a pomologist, was one of the foremost fruit growers in America who experimented with new varieties of fruits at his home in Burlington, New Jersey. He collected specimens from the United States and abroad. A View of the Cultivation of Fruit Trees in America is a classic of American pomological literature. It is considered by many specialists as the illustrative evidence of fruit culture during the colonial and revolutionary period of the new American nation. William A. Taylor, assistant pomologist, U.S. Department of Agriculture, read an 1857 article in Country Gentleman about the manuscript. Through the use of Library of Congress geneological materials, Taylor was able to contact Coxe’s family members and locate the manuscripts. The grandchildren of Elizabeth (Coxe) McMurtrie, one of Coxe’s daughters, donated the manuscripts to Secretary of Agriculture D. F. Houston in 1915. Processed: No, contact Special Collections. Tagged Atlas of Apples, Cultivation of Fruit Trees, Pomological Illustration, Pomologist, The William Coxe Manuscript, William Coxe Jr. Most horticulturists are doubtless familiar with “A View of the Cultivation of Fruit Trees of America,” published in 1817 by “William Coxe, of Burlington, N. J., who has been called “The Father of American Pomology,” but probably few are aware of the existence of an unpublished book of colored drawings of the fruits that were illustrated in this work by wood cuts. On pages 225-226 of the Country Gentleman, of Albany, ~N. Y., for April 2, 1857, there was published by E[dmund] L[aw] R[ogers], Baltimore, Md., an account of the activities of Mr. Coxe, in which it is stated that he had intended publishing a second edition of the work, accompanied by colored engravings for which natural-size water-color drawings had been prepared by his daughters. The publication of this second edition was prevented by Mr. Coxe’s death in 1831. About twenty years ago this article came to the attention of Mr. William A. Taylor, then assistant pomologist of the TJ. S. Department of Agriculture, and a number of letters were written in an effort to locate the colored drawings, but without success. The matter was then dropped until the spring of 1915 when, in a conversation regarding some old horticultural catalogs, Mr. Taylor related these facts to the writer who suggested that it might still be possible to locate the unpublished colored plates through methods used by genealogical research workers. The search was begun by looking up at the Library of Congress historical and genealogical works which might give information regarding the descendants of William Coxe, with the result that a list of his children was obtained, with some of their marriages. From this it was learned that Philadelphia and vicinity was at present the most likely locality to search for his descendants. Addresses were obtained of several of the Coxe family in that vicinity and a form letter sent to all of them giving the object of the inquiry, with the result that a chart of this branch of the family, only recently published, was secured by the writer. This gave the names of all descendants to date, but without addresses, although the places of births were usually given. With this clue several city and tele- phone directories were consulted and addresses of most of the descendants obtained. About twenty-five copies of the form letter were then sent to these addresses with the almost immediate result of six replies giving the address of the probable possessor of the work, followed the next day by a letter from one of the twenty- five addressed acknowledging the possession of the work. 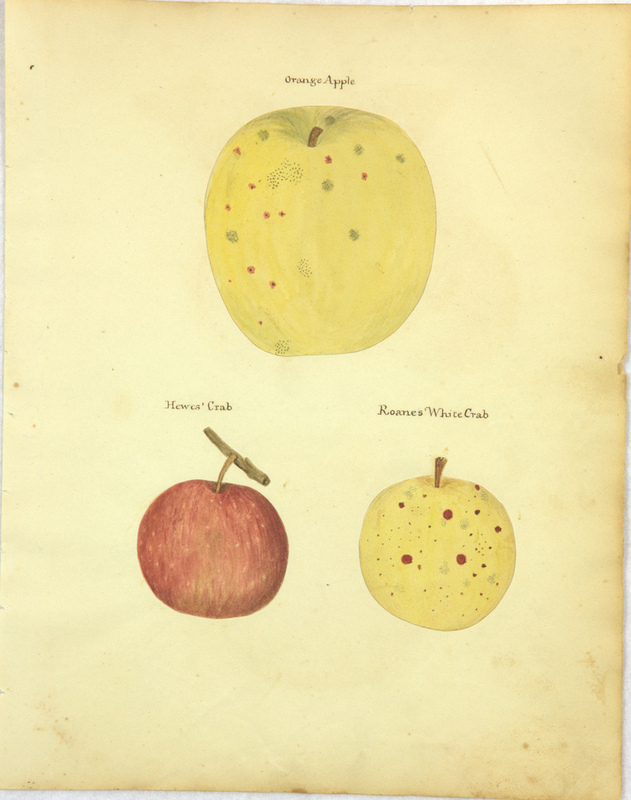 It is with great pleasure that announcement is made of the donation of the unpublished colored drawings of fruits to the Library of the U. S. Department of Agriculture by the grandchildren of Mrs. Elizabeth (Coxe) McMurtrie, a daughter of William Coxe, by whom most of the paintings were made. The drawings are bound and in an excellent state of preservation. The character of the work shows a high degree of skill on the part of the artist in depicting fruits; and the positive identification of all the earlier descriptions and illustrations, some of which have long been in doubt, will now be possible. The work has been placed in a fireproof building and it is expected that the additional safeguard of a fireproof safe for this and similar books will be provided at an early date. The drawings are accompanied by the bound manuscript upon which the published work was based, to which have been added numerous notes intended for a second edition. Many of the notes bear dates ranging from 1810 to 1828 and it probable that the water-color work was largely done in the early part of this period, for several varieties are illustrated which according to the manuscript did not live long, or were destroyed as being of little value or particularly subject to disease. Tagged Pomological Illustration, The William Coxe Manuscript, United States National Agricultural Library, William Coxe Jr.